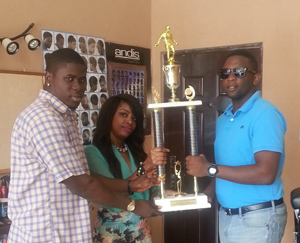 Prestige Unisex Hair and Nail Spa, Sammy Beatz and Vonetta Harris (left) hand over the second-place trophy to Aubrey Major Jr., yesterday. Entertainment (NEE) annual Stag/Cell Smart Futsal tournament, which is scheduled to begin this weekend at the MSC Hard Court, following a grand Opening Ceremony. The Hair and Nail Spa handed over a second place trophy for the tournament. Meanwhile, one of the organisers from NEE, Aubrey Major Jr., told Kaieteur Sport yesterday that they increased the prize money from what was previously released. Initially, the tournament had issued a $200,000 first place purse. The second place team would have received $100,000 while third pockets $75,000 and fourth $25,000. But those have been on the up, with the winner now getting $250,000, second $116,000, third $91,000 and fourth $41,000 respectively. The tournament will feature all of Linden’s top futsal teams from November 1-15.